You put too much stock into measurables and speed. Measurables and speed are really important for NFL success. Almost every guy on this list is either big, fast, or both. If that's what works in the NFL then that's what people should seek out in NFL prospects. Mike Evans and Laquon Treadwell both fit the mold, being 6'2"+ and 225+ pounds. Antonio Brown is the only guy on the above list who doesn't have either a 27+ BMI and/or a sub 4.50 40 time. You'll be hard-pressed to find a top NFL WR who doesn't have speed or size, which is why I often start by looking at those things. I've seen a lot of Hunt. He regularly gets chased down by MAC defenders. Great numbers, but don't see how he's any better than David Fluellen was. Scarbrough has a better chance of being something much better. It's also confusing how you put so much stock into movement skills, yet think Laquon Treadwell and Derrick Henry are overrated. You put so much stock into measurables, yet think Henry is overrated. I'm not talking about NFL players. Show me their weight and 40 time from HS. Mike Evans is listed at 180 in HS, Treadwell at 198. It would help if didn't quote me out of context. Really quick feet. Runs like he's shot out of a cannon. 100m PR in the 10.5 range. Needs to bulk up, but he should be a very dangerous weapon for Baylor. I wouldn't say he wasn't highly sought after. Rivals, Scout, and ESPN all had him as a 4* recruit. In the grand scheme of things, that's high. Cool, I just know A&M could have had him and don't remember any other schools really pursuing him. I'll have to keep an eye on him at Baylor. Hunt is pretty fast. He was a contender for the state title in the 100m in his division in Ohio. You cannot manufacture 10.8 speed. I have seen plenty of times when he has burst into the open field and showed it in his games. There's also the fact that he's probably 220+ pounds. He doesn't need to be Usain Bolt when he's that big. At that size you can get away with 4.5+ like Ingram, Benson, Foster, Martin, Lacy, and others. I like Treadwell fine. Derrick Henry is not my cup of tea. Tall and straight line in his movement. Not a lot of agility. His legs are so long that he doesn't evade well. In terms of measurables, he ran a 4.72 at the Nike combine. I do think he plays faster than that and will test faster, but he's not my idea of a physical prototype at the RB position. Chubb and Elliott are more like what I'd want to see. Squatty and strong with good bulk, a low center of gravity, and well above average speed. Who is more likely to develop NFL caliber measurables: the kid who already has them at age 18 or the kid who would need to develop significantly in order to have them? That's an easy question. If somebody already has NFL size/speed at age 18 then that eliminates one layer of risk because there's no possibility of him not having NFL caliber measurables 3-4 years down the line. On the other hand, if you have a kid with dynamite skills who's skinny and/or slow then there's an added layer of risk because you have to hope that he can add the physical aspect during his college years. Some do and some don't. When you limit your selections to players who already have those qualities, you avoid that hurdle altogether. That's why I'd pretty much never draft a skinny or slow HS kid in a shallow dev draft. Sure, some of those guys will add weight and explosiveness. Many won't. I don't need to play the guessing game when I've got Nick Chubb or Thomas Tyner sitting there with NFL ready tools out of the box. It's about mitigating risk and removing unnecessary guesswork from the equation. I don't recommend drafting a lot of HS kids high in devy leagues, but when I make those picks I always make sure it's a kid who already has the athletic tools. Henry being a straight line runner is pure fallacy just like people saying Gordon was. The same with his agility. He's bigger than Gurley, yet much looser in the hips. I'd rather draft a WR who shows certain movement skills and receiving abilities even though they don't have eye-popping measurables. If someone is to take a Freshman WR in a shallow Devy, I think they should do their due diligence and include on-field skills as part of their evaluation. Anyone with thoughts on Devontae Booker of Utah? I've only started doing devy leagues a couple of years ago, and while I like the format, I'm not a huge college fan and don't have the time to follow it very closely. Trying to make a pick this early in the offseason with so little info out there (and most of it of questionable reliability) is frustrating. Generally I'm finding myself just trying to pick guys with good stats and reasonable size/speed combos from bigger conferances. He looks to be an eventual Day 3 the prospect. I don't see a good enough talent there to select in a shallow Devy, assuming that's your format. Reminds me of Charles Sims. Its not just DLF that happens to like those guys though. Take a look at some early 2016 mock drafts. Both Boyd and Duke are pretty consistent 1st rounders in the mocks, and Boyd is typically going 10th-17th. Here's a few examples. Draft scout has Duke Williams listed as their #1 2016 WR at this moment. Tyler Boyd is their #2 WR listed for 2017. (both are eligible in 2016). A year from now we will have a much better idea who the top WRs in the 2016 draft will be. But we all know that going in. Any 2016 ranking today is far more speculative than it will be a year from today. But to say that the guys at DLF are on an island ranking both of those guys highly is off base. Freeman ran dives left and right. I wouldn't put any stock in that stat. Cook is near 200 pounds at 18/19 YO. He carried a very solid load, again, at 18/19 YO. And 4.4 on 200 is pretty "wow" to me. Same idea applies though. Those mocks are based on hearsay and analysis from people who are essentially amateurs. I wouldn't take their opinions as anything more than a rough estimate. These are the same kind of people who had Brandon Coleman and Jeff Fuller as first round picks going into their final college seasons. Even DraftScout, which generally does a good job of ranking players, still has some funky stuff in their future lists. For example, Barry Sanders as the #10 RB in the 2017 draft even though he has struggled mightily to earn consistent playing time at Stanford after three years on campus. If you don't have time to do your own homework then you almost have no choice but to trust what you read online, but if you do have time then you might be better off developing your own conclusions because mocks 1-2 years out just don't carry nearly the same weight as actual NFL draft position and are much more open to wide interpretation. Apart from that, I just think a lot of the devy rankings that you see on the Internet come from a small echo chamber of part-time analysts and create a false consensus about who you're supposed to take. What's so great about Duke, Wilson, and M Williams that separates them from all the other college receivers? It's not their stats. You could say physical tools, but those guys aren't necessarily FREAK athletes. Duke put up a per/13 of 60/960/7 with a WR throwing him the ball. Big, strong, fluid, athletic frame with crazy mitts/catch radius. Alshon Jeffery level athlete. Williams put up 1K in his first year as a starter--catching most of his passes from a guy with more INTs than TDs and a raw QBR in the 30s. He's in the A.J. Green mold of freak athletes--it might not test well in shorts and a T-shirt, but put the ball in the air and it's apparent. Wilson is clearly a FREAK athlete. I have seen a fair bit of Freeman and I can't really think of one thing he does at an exceptional level. His best attribute is probably his frame. I think he's basically really good at getting what's blocked and that's it. I don't see him making a lot of standout individual plays. His quickness is okay. Speed probably below average. Doesn't run with as much authority as you'd think looking at him. He's young and maybe he'll develop over time, but I think his freshman clips make him look more like an Antowain Smith type of back than someone who's really dynamic like Ricky Williams or Jonathan Stewart. I think Cook is okay, but right now he's in that dangerous zone of being not big enough to run with power and not fast/explosive enough to thrive in the NFL based solely on his speed and quickness. You can get by at that size/speed if you're as quick as McCoy or Abdullah, but I don't think he is. And his 100m PR of 10.97 isn't close to what you want to see from a smaller back who doesn't have elite jukes. Bush, Charles, Spiller, C Johnson, Best, and others all either ran 4.2-4.3 and/or sub 10.50 in the 100m. I think that's a fair call on Freeman. His biggest + is size/speed combination and college production in a funny scheme. I think he's got a good shot to be valued as Hyde/Hill were, eventually. It says a lot that he cleared out a highly thought of backfield as a true freshman. I disagree with you on Cook. He's a very natural, instinctive runner with plenty of physical ability. His frame is only a question when comparing him to elite NFL backs. So while there some negative "complimentary" potential, he's clearly on his way to some level of an NFL frame. He's not as quick as McCoy/Abdullah--but who is? I see an NFL ready runner as a 19 YO with a good shot to develop a + body with homerun speed, receiving ability, and great vision. 6/205 4.45ish is absolutely an NFL RB HWS--and he's only 5-8 pounds away from that with 2-3 years to go. I'm with you on Cook. Some of the best vision I've seen. As far as cutting ability, it's definitely there. He's bigger than Abdullah, so I don't get that comparison. 6'/205 is definitely perfect. I know it's early but my dynasty rebuild needs all the help it can get. This is pretty much where I'm coming from. Just seems backwards to preach drafting Devy RB's that already have NFL bodies and measurables, but then focus almost solely on the undersized, speedy devy WR prospects that need elite QB play to be consistent in fantasy. They are more situation dependent than any other devy prospects you could draft. I'm sure you've given them a thorough look EBF, and I appreciate the breakdowns of Noil/Cannon, just seems strange to require an NFL body at RB but ignore the top consensus prospects at WR (regardless of the wannabe "experts" that form that consensus) that also have NFL bodies, or only require a projection of adding 10-15 pounds to a tall, young frame to become NFL-ready. You've come a long way since telling me I put too much emphasis on measurables, EBF. I honestly can't tell the difference between what you're saying and I might say anymore. Freeman had a good year overall, but Tyner was the starter at the beginning of the season and Tyner outshined him in the CFP games. There's a chance that Royce will take a leap in year two due to physical maturity, but there's also a pretty signifcant risk that a healthy Tyner and the arrival of Merritt/Griffin/etc will reduce his role. I could see his stock taking a hit next year in the same way that Tyner's did last year or TJ Yeldon's the year before when those guys were hot after promising freshman seasons and then saw their devy stock cool off after they regressed statistically the following year. As for Cook, 6' 205 would be a terrible combine size for him unless he's cranking a 4.3-4.2 in the 40. The only successful NFL RBs who are that lean in terms of BMI are guys like Charles, Spiller, and CJ2K who have otherworldly speed. Now I don't actually think Cook is 6' and I'd guess that he can bulk up a little bit, but that's all guesswork. It seems to me from experience that being in the 200-210 pound range with good, but not elite speed and quickness is sort of a "dead zone" for NFL RBs. That's where guys like Donald Brown, Bishop Sankey, and Felix Jones were. Not quite big enough to run with power. Not quite fast enough to win with speed against NFL defenses. It's still workable if you have the unreal quickness of Abdullah or McCoy, but I didn't see that from Cook. I think both guys are decent prospects. I just wouldn't use a first round devy pick on either right now. When I was preparing for our draft, I sort of had the RBs split into three different categories: probably, maybe, and probably not. Chubb, Elliott, and Perine were the only guys in my probably tier. Freeman and Cook were in the "maybe" tier along with Kareem Hunt and Boom Williams. That was a level above the "probably not" group that included guys like Jarvion Fraklin, Derrick Green, Nick Wilson, Demario Richard. Merritt was kind of a wild card because he's a HS player, but I had him as a must-get player for me. Anyway, the point is that I don't hate Cook or Freeman. I'm lukewarm on them. For me to think a guy is "dev worthy" in a one round draft, I have to be almost totally sold. Not the case with those two. Maybe it changes a year from now. Maybe not. I'm definitely not a 100% measurables guy. If I was, I would pick Kareem Hunt in every dev draft possible. However, some of this stuff is just undeniable and if you spend any time looking at it then you will notice some patterns in what tends to work in the NFL and what doesn't. I think a lot of the pushback comes from people who simply haven't invested the time in it and thus don't really know what they're talking about. It's like they'll criticize you for caring about measurables and yet you look around the NFL and so many of the guys who have had great careers are also workout freaks to the max (Graham, Tomlinson, Peterson, Calvin, Andre, Julio, etc). I think it's possible to take things too far and value measurables too highly, but at the same time it's very easy to not put enough stock in them. My perfect prospect would be someone with great production, great physical tools, and awesome tape. If a guy has all three of those things then I'll usually like his chances of being successful. If he has just one or two of those things then there's an element of risk. I try to cut that out as much as possible. So if I can find 2-3 guys in a draft pool that check every box, of course I'm going to place my bets on them instead of hoping that one the ugly ducklings comes good. This is not the same as saying that players must have great measurables to succeed. A lot of people interpret it to mean that though. What's the historical track record of HS prospects that have great measurables materializing into elite NFL prospects? How about doing backwards analysis and showing the HS measurables of the top NFL players? I didn't ignore them. I looked at them and decided that I didn't want to take them. No different from my process with someone like Jarvion Franklin. He's listed at 6'1" 220 and he rushed for 1500+ yards in his freshman season. He has NFL-ready size and promising overall stats. I must love him, right? No, because I went through and watched his film. It wasn't terrible, but I wasn't sold on him either. So he was never a serious consideration for me. Just a watch list guy for the future. Likewise, the fact that Mike Williams or Duke Williams has X listed height/weight and Y statistics doesn't trigger some automatic response where I have to like the guy. In the case of Williams, he's actually very light. Lighter per height than even AJ Green and Jeremy Maclin. Apart from that, I didn't find his movement to be that great. Yea, he can extend and catch the ball. The other part of playing receiver is running and getting open. That's where I don't see a parallel with AJ Green, who is more athletic and impressive in that regard. As for Duke, I don't hate him. He's got the right physique and toughness for the NFL. He looks solid. That doesn't make him Dez Bryant though. A player has to be very special to dominate in the NFL. I've never gotten that "wow" feeling from his clips like I did with Dez, Blackmon, or even Crabtree. He seems more like a Mike Williams (Tampa) type of talent. That's fine, but not what I'm looking for. There's no magic formula or one single variable that determines my picks. I do like to see elite tangible physical traits. However, they're more necessary than sufficient for me. Beyond that, what you and I might consider "NFL-ready" talent are probably two different things. For example, a lot of people will look at Mike Williams' listed dimensions and think he has "ideal" dimensions for the NFL. When I see his numbers, I noticed that his weight is extremely low for his height. Strike one. I don't have any concrete tangibles to suggest that he has elite speed to compensate. Strike two. That's in stark contrast to Kareem Hunt, who not only has an ideal 5'11" 220 pound frame, but also has a 10.8 100m time and a 6'8" high jump to indicate that he's going to crush the combine in a year. From a pure measurables standpoint, he has a much more compelling case for having elite tools than someone like Mike Williams or Duke Williams. However, the tape is a whole different variable. There's no way to know that because a lot of eventual elite NFL backs didn't participate in track or high school combines. The HS combine scene has gradually blown up in the past decade, so we're getting more and more info on these guys at a younger age. That will give us more data in the future. I don't have HS 100m times for Jamaal Charles, but he was Texas 5A state champion in both the 110hh and 300h as a senior. He ran a 10.23 in the 100m as a freshman at Texas. That being the case, I'm going to guess that he could've cranked a 10.4 at minimum as a HS senior. I don't have a 100m time for Jonathan Stewart, but he ran a 6.92 in the 60m as a college sophomore. From conversion tables that I found on track sites, that equates to about a 10.6 in the 100m. Looking at the current devy crop, Ezekiel Elliott won four Missouri state titles in track in his division: 100m, 200m, 110hh, 300h. His times would not have won in a competitive division in a big state like CA, TX, LA or FL, but they were not bad (10.95 in the 100m, with a 10.90 PR). Nick Chubb ran a 10.69 automatic in qualifiers before winning the GA state title in the shotput. I have Todd Gurley down with a PR of 10.70 in the 100m. So that's three of arguably the top 4 devy RBs who have a strong tack background. None of this means that a player needs elite track results to be a strong prospect. I'm fairly sure that Frank Gore, LeVeon Bell, LeSean McCoy, and Arian Foster would've been smoked in HS (or now) by any of the guys I mentioned above. All the same, if I'm going to take the devy plunge on a HS kid with no track record of NCAA performance then it would have to be someone who has already demonstrated elite physical tools. When those guys are available, there's no reason to take someone who requires a projection of gaining strength and/or speed. I was just correcting the name. He said Taj Gibson....he's a basketball player for the Bulls. You're too into numbers and not enough into film. Tyler Boyd, De'Runnya Wilson, Duke Williams, Malachi Dupre, Mike Williams are good to great FOOTBALL players. The WRs you listed will do well in the underwear Olympics. The only one i'm high on is Scott, but he actually has good football skills as well. You're very high on BMI and i've yet to see how that has any relevance to producing better FF numbers for a WR. Kareem Hunt isn't in the rankings because he's not one of the top 25 RBs in college football. He doesn't run in the 4.4's and his HS track times are irrelevant to what is shown on the football field. You fail to see how they could all list Bo Scarbrough in their top 25, despite not playing a game of college football. Yet you took Kirk Merritt #11 overall in a devy draft, without playing a down of college football. What surprises me is the degree of uniformity in some of the rankings. That was my main point. I would not expect every staff member to have Hunt rated in the top 25 backs, but you'd think at least 1-2 might like him enough to put him there. Is he a perfect prospect? No, but there are enough positives that you'd think one or two guys would like him enough to find a spot for him in the top 25 backs. I don't see how he's less deserving than guys like Scarbrough, Roc Thomas, Hurd, Hood, Washington, Perkins, and Michel. His college accomplishments are far greater, he's closer to being draft-eligible than most of those guys, and it would be tough to argue that most of those guys have superior physical tools. His 100m time is very relevant insofar as it reflects his innate speed and offers a hint about what kind of time he might run in his workouts, which will affect his draft position. I can understand if some people don't think he's better than some of those other backs I mentioned, but it's surprising that nobody thinks he is. Most of those guys will probably never have a season as good as the one he just posted and few of them appear to have the superlative physical tools to justify a high speculative ranking, so the logic for putting them higher seems pretty suspect to me. The devy/draftnik community is pretty insular and it just seems like if 1-2 influential people start banging the drum for a player then all of a sudden he will appear on every person's list. Likewise, if a guy doesn't have the right hype for whatever reason then he will fly almost totally under the radar. I don't even know if Elliott and Chubb would've been in that top 25 last year at this time. In hindsight they were deserving. Likewise, I don't know why Michel would be a consensus pick whereas Boom Williams isn't on a single list. More outliers would actually be encouraging, as it would suggest that more independent thought and analysis are taking place. Ultimately, it doesn't matter to me. If anything, it works to my advantage. I loved seeing Perine fall to me at 1.08 in our Deep End draft while guys who weren't in my top 15 went ahead of him. I'm just saying, that as someone who casts a wide net and looks at probably 100+ prospects each year, it's always a bit surprising and interesting to see how the "consensus" calcifies around certain players and how those opinions vary from my own conclusions. Inevitably there are some things that just don't make a lot of sense to me. I see you're on that Boom Williams > Michel bandwagon. Hmmm. I'd take Elijah McGuire ten times over taking Kareem Hunt. Hunt runs a 4.55ish 40, he gained 15 lbs since HS...which makes his 100 meter HS time irrelevant. On the field, he's not explosive/stiff hips/not great change of direction skills. McGuire has great hands, good burst, tops out at 4.5 at worst, great change of direction skills/agility, and runs with power when needed. You love Speed Scores. Which is a formula of size + speed...which sometimes works out. But you also are left with Chris Henry RB Arizona or Mario Fannin RB Auburn or Andre Brown Rb NC State or Andre Williams Boston College. What matters on the field matters most. I get the criticism and it has some merit, to a point. The fact is there is a seemingly endless supply of college football players and you and I, nor anyone else can know them all. So, when someone who has a respected voice speaks up for a player, I listen, learn and it can affect my rankings. Do my rankings affect other rankings or drafts? I have no idea. On another note, we (DLF) are currently undergoing an overhaul on our devy rankings system. You'll see a major update in the next couple of weeks that should provide more clarity. I question how you're using BMI here. I'm not arguing that any combination of his HWS means that he will be X, Y, or Z. I am arguing that his projected 6/205 frame won't prevent him from being X,Y, or Z. Plenty of RBs his size have held up physically at the RB spot in the NFL. Then it comes down to his talent and ability--which has nothing to do with Felix Jones, Donald Brown, or Bishop Sankey. I've never owned Fannin, Henry, or Brown in a FF league. I did like Williams last year, but with some reservations. I also don't own Hunt anywhere either. Part of that is because I agree that his change of direction isn't great. I don't see a first round ceiling there. I think he will go 2nd-4th depending on what he shows this season. However, I can't make a case for 25 NCAA RBs ahead of him. Yes, he has flaws, but it's not like there are lots of perfect prospects floating around out there. Once you get past the top 3-4, almost everybody has significant flaws. With that being the case, he should probably be ranked higher. It's not about the size. At this point size means very little to me on its own. Some of the best RBs in the NFL are light. However, small backs generally have to compensate with something special in terms of agility or quickness. A big back like Doug Martin or Eddie Lacy can get away with mediocre speed and quickness because they also have power. In contrast, every small back in the NFL has exceptional mobility. McCoy is too quick for anyone to tackle. Charles, Spiller, and CJ2K have elite wheels. If you go back and look at NFL draft results, you'll find that the league generally only spends 1st round picks on guys who either have good size and reasonably good explosiveness or small size and elite speed. When they deviate from that pattern, they get Donald Brown or Felix Jones. With that being the case, I'm not interested in a small back unless he can fly or is freakishly elusive. Neither applies to Cook right now IMO. Cardale Jones, what are the thoughts on him? Top 10 pick in a SuperFlex Devy Draft? Takes both, and both can be seen in the stats. We really, really need a way to judge rookie predictions people make before the draft. Track speed and football speed are different though. Some WRs run fast routes but not with the football in their hands. 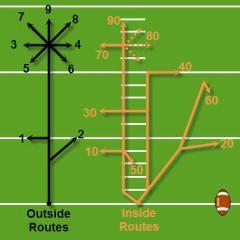 Can't measure a players vision, route running, leverage, instincts, etc with numbers. I'm not against analytics, but I am against disregarding players before checking tape. The point is based simply on numbers is a faulty conclusion. I would take all of these 25 RBs hands down over Hunt: Chubb, Elliott, Clement, Fournette, Henry, Conner, McGuire, Cook, Johnson, Freeman, Guice, D. Harris, J. Williams, Collins, Pressley, Mixon, Perine, Scarlett, Hood, Tyner, J. Robinson, Scarborough, Ballage, Breida, Jones II. This is a list I would probably take these 11 RBs over Hunt: Kamara, Drake, Green, Michel, Roc Thomas, Hurd, Jones, Barkley, Jamabo, Love, Weber. Hunt is in the discussion with these 11 RBs players: Swinney, Griffin, Patrick, Dexter Williams, Mack, Wilson, Samuel, Linwood, Gray, Green, Washington. Yes. My #1 QB and he has the arm to do it all. His touch on deep passes is not discussed enough. Needs to work on footwork and decision making. I went back recently and looked at some college highlights of eventual top NFL RBs like Ahman Green, Shaun Alexander, and Ricky Williams to remind myself of what a truly elite prospect looks like in college. Those guys really jump off the screen in a way that few players do. Hunt isn't on that level. Even a guy like Mikel Leshoure had better college highlights. So don't think I'm sky high on Hunt as some kind of an elite lock. If I thought he was amazing I wouldn't have passed on him twice in our draft. He may be an early day three guy in the NFL draft when all is said and done, but I think he's still worthy of a top 25 spot on any all-class devy RB list. You can throw out 35 names that you think are better than him, but ultimately that's just one man's opinion and if I've done my own homework to draw my own conclusions then I don't need to put any stock in it. I went back recently and looked at some college highlights of eventual top NFL RBs like Ahman Green, Shaun Alexander, and Ricky Williams to remind myself of what a truly elite prospect looks like in college. Those guys really jump off the screen in the way that few players do. Hunt isn't on that level. Even a guy like Mikel Leshoure had better college highlights. So don't think I'm sky high on Hunt as some kind of an elite lock. If I thought he was amazing I wouldn't have passed on him twice in our draft. He may be an early day three guy in the NFL draft when all is said and done, but I think he's still worthy of a top 25 spot on any all-class devy RB list. You can throw out 35 names that you think are better than him, but ultimately that's just one man's opinion and if I've done my own homework to draw my own conclusions then I don't need to put any stock in it. I watched Hunt again. He's got some lateral quicks. Runs hard. Vision is very good. He's basically just a younger version of Jonathan Williams. Williams at least has the SEC pedigree and is unfairly underrated right now. Probably my top Senior RB next year. I think Williams is alright. I don't think he will test quite as well as Hunt might, but he's probably the more economical runner with better agility. He got feedback from the advisory committee and whatever they told him wasn't enough to convince him to leave Arkansas, so I'm guessing it was a modest projection. Still, he will definitely be drafted. This is also just one man's opinion. We'll have to agree to disagree on Hunt because I don't see the speed/athleticism that you hype. Williams has better speed, quickness, agility, and runs tougher than Hunt. I can't talk highly enough of Corey Davis WR Western Michigan. The best route runner I've ever seen in college. Good athlete, 6'2, good yac. De'runnya looks to have the frame to dominate. Mike Williams has more speed and a bit more fluid. I think Mike's ceiling is DeVante Parker, but he's gonna need to polish up his game like Parker did. There is some Sidney Rice and Leonard Hankerson to his game, too. To add onto this post.. He is currently listed at 220+ in his college bio. I would take this kid easily over George Campbell and I have no idea what his measurables are. He just looks too good on tape, especially his routes and strength. And he played in 7A. The highest level in his state.